Journalism, as we have known it, is on life support. It is slowly dying and prospects for recovery are slim. There are just too many forces working against this noblest of efforts for it to survive with its integrity intact. This lingering approach to death is happening for four reasons; first, is the rapid change in the manner in which Americans consume news due to the internet. The second is the loss of independence. Third, is conglomerate ownership and the fourth, is the continually increasing demand for greater profitability. It used to be that almost every community had a daily or weekly newspaper that was locally owned. So too was the radio station. If a community had more than one radio station they were owned by different companies or people. There were a few companies that owned more than one radio station, but never in the same community, and it was rare for anyone to own more than a half dozen. Regulators had put a cap on how many broadcast facilities any person or company could own. If a local newspaper owned a radio station the station had to prove when license renewal time came, that they were independent of the newspaper and that it did not influence their news reporting. That situation existed to ensure that no person or group of persons could form a media monopoly and in effect control the flow of information in a community. It was generally accepted that because diverse media ownership allowed for the communication of diverse thoughts the result would be a more informed public. Furthermore, the law made it clear that if a community had more than one radio station, each had to have a different owner. The reason for doing that was to create a healthy media environment in which citizens could hear, see and read the thoughts and views of a variety of people which would help voters make more informed decisions at the polls. Unfortunately, that’s all changed. Print journalism is fading faster than its broadcast sister and that is particularly sad because it is the print media that have always offered depth. Radio and TV have, with some exceptions, been mostly headline services, but print has always been where people turned to get every detail of every story. Unfortunately, they are no longer doing that and the result is catastrophic. A 2015 report from the Brookings Institution shows that the number of newspapers per hundred million population fell from 1,200 (in 1945) to 400 in 2014. Over that same period, circulation per capita declined from 35 percent in the mid-1940s to under 15 percent. The number of newspaper journalists has decreased from 43,000 in 1978 to 33,000 in 2015. Even the most famous of all American newspapers, The New York Times, is suffering. The decline in print advertising revenue at the Times has accelerated from 9 percent in the first quarter of 2016 to nearly 19 percent in the most recent quarter. The paper not only admits the figures are correct it says that it expects things to get worse. Some insiders say the “Gray Lady” as it is known, is in free fall despite valiant attempts to save itself by expansion into the digital world of the internet. The almost as famous Wall Street Journal is suffering as well. The paper has announced plans to consolidate sections of the paper and to initiate more layoffs as it scrambles to grow the digital operations that could save it. Recently the paper laid off the entire staff of its Greater New York section and offered buyouts to 450 employees. So far fewer than 100 have accepted the offer which sets the stage to raise the paper’s internal misery index. The demise of journalism as we know it does not mean that information will not be available. To the contrary, the flow of information is increasing every day as is the number of sources that provide it. In the past, we knew we could depend on the three networks and our favorite newspapers to provide us the information we need to make informed decisions. As the number of electronic or digital sources increases, though, so does the difficulty in identifying those that are trustworthy. At the same time, the old sources, network TV and the print media are being pushed out of the picture with declining circulation and viewership. Even the cable 24-hour news and information networks are losing out because, despite claims to the contrary, they really aren’t very mobile. It seems as though cell phone accessibility is fast becoming the criterion for the dissemination of news. The social media explosion has resulted in thousands if not millions of sources of information. Some are obviously biased and inaccurate, but many look and sound just as professional as the old traditional sources of news. Few of them, though, stand up to the test of time and to the standards of professional journalism set by pioneers like Edward R. Murrow whose words echo with new urgency today. The standards of Murrow and Cronkite and Brinkley, however, are not the standards of the thousands who call themselves journalists, but whose real goal is not truth but profitability. Their emphasis is not on public service and factual reporting, but rather on expanding circulation, higher ratings and greater profitability. They adopt the mantle of journalistic integrity and all the professional trappings but report only those stories that either satisfies their biases or the biases of their corporate masters. Our free society is threatened by those who pose as professionals, but are in fact dishonest, unethical voodoo journalists. It is this masquerade with all the trappings of professional journalism that we must watch for and reject. It will not be easy because their selection and delivery of what they call news will be so slick as to fool the average consumer. This threat comes from the consolidation of media outlets under just a few huge parent companies. Few are aware that 90 percent of the media in the United States is owned by six companies. Those half-dozen control what we hear, see and read and if they control the media isn’t it fair to assume they also control the message? We cannot continue to function as a free society without the checks and balances offered by a free and independent press. Also called the “Fourth Estate” a free press is the independent body that keeps the Government in check. Without it, we’d be a dictatorship. While the three branches of government offer many important checks and balances they need a free press to assist them. In 1841, Thomas Carlyle wrote, “Edmund Burke said there were Three Estates in Parliament; but, in the Reporters’ Gallery yonder, there sat a Fourth Estate more important far than they all”. Four years earlier, Carlyle himself wrote, “A Fourth Estate, of able editors, springs up, increases and multiplies; irrepressible, incalculable.” Carlyle saw the press as instrumental to the birth and growth of democracy, spreading facts and opinions and sparking revolution against tyranny. 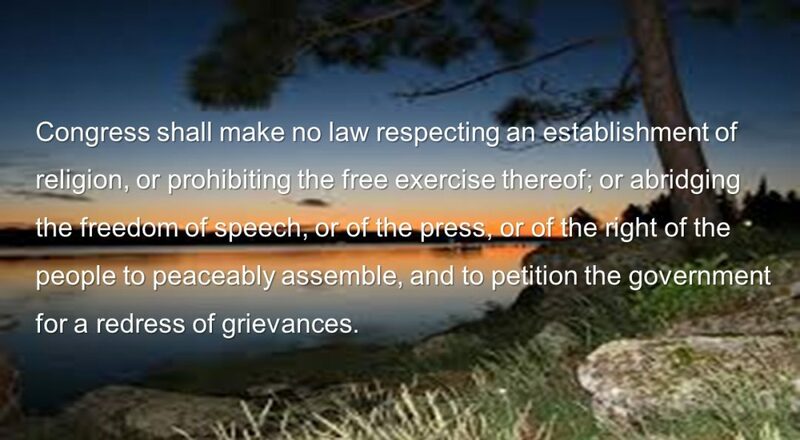 In order for the fourth estate or the news media to be effective, however, it must be independent, diverse and free of any control by government or anyone else. The American news media has traditionally been just that, but those three elements are changing. While our media today are in fact independent and free of government control, they are becoming less and less diverse in ownership which means freedom is slipping. Do we have a press free of government influence? Yes, but we don’t have a press free of the shadow government – Corporate America. Community owned and operated media outlets are increasingly rare. Huge media enterprises are buying radio and TV stations and the few newspapers that haven’t already shut down. It’s called cross-ownership and it’s the result of the deregulation craze. Earlier I mentioned that six corporations own ninety percent of the U.S. Media. These conglomerates own broadcast and cable television, film, radio, newspaper, magazine, book publishing, music, video games, and most of what’s offered on the internet and that has a direct effect on the information you receive. As time goes on we have fewer companies owning more media outlets. The gobbling up of the media is taking place at an incredibly fast rate and most of the public are totally unaware of it. The Walt Disney Company. ABC Television Network, cable networks ESPN, the Disney Channel, A&Eand Lifetime, approximately 30 radio stations, music, video game, and book publishing companies, production companies Touchstone, Marvel Entertainment, Lucasfilm, Walt Disney Pictures, Pixar Animation Studios, mobile app developer Disney Mobile, Disney Consumer Products and Interactive Media, and theme parks in several countries. Also has a longstanding partnership with Hearst Corporation, which owns additional TV stations, newspapers, magazines, and stakes in several Disney television ventures. 21st Century Fox Fox Broadcasting Company; cable networks Fox News Channel, Fox Business Network, Fox Sports 1, Fox Sports 2, National Geographic, Nat Geo Wild, FX, FXX, FX Movie Channel, and the regional Fox Sports Networks ; film production companies 20th Century Fox, Fox Searchlight Pictures and Blue Sky Studios. Time Warner, CNN, the CW(a joint venture with CBS), HBO, Cinemax, Cartoon Network/Adult Swim, HLN, NBA TV, TBS, TNT, truTV, Turner Classic Movies, Warner Bros. Pictures, Castle Rock, DC Comics, Warner Bros. Interactive Entertainment, and New Line Cinema. CBS Corporation. CBS Television Network and the CW (a joint venture with Time Warner), cable networks CBS Sports Network, Showtime, Pop; 30 television stations; CBS Radio, Inc., which has 130 stations; CBS Television Studios; book publisher Simon & Schuster. Viacom MTV, Nickelodeon/Nick at Nite, TV Land, VH1, BET, CMT, Comedy Central, Logo TV, Spike, Paramount Pictures, and Paramount Home Entertainment. “So,” you might say, “that’s all interesting information, but why should I care? How am I affected?” That’s a very good and important question, and here’s the answer. These people decide on the information you will get and how it will be delivered. Let’s use a real example. This really happened. One day recently the horrible war in Syria saw Russian, American, Israeli and other jets pounding the area in an attempt to seriously damage ISIS, while at the same time Donald Trump was tweeting that anyone who burns an American flag should be punished by either having their U.S. citizenship revoked or be sentenced to a year in jail. The flag burning tweet led the news and the Syrian war was just another story. The burning of a Chinese made American flag affects no one. The Syrian war has a broad effect on everyone, from accepting refugees to the cost to taxpayers of flying the jets and dropping the bombs. To understand why this is important I must digress. In the old days of TV News, the Syrian war would automatically have led the news because of its huge effect on everyone in the world. The Trump tweet would have been an item, but nowhere near as prominent. The big media companies are forever surveying people to find out viewing habits, what kind of news they like, the length of their attention span and how they like to receive their news and they’ve found that issues and content are not as important as length and simplicity. The shorter more easily understood story gets priority so the tweet leads the news. If you watch the BBC you’ll find that their news lineup includes stories that we never see or hear. Why? It’s because they are more likely to select the order of stories based on their importance to the world rather than pandering to the audience in order to get ratings. The fact is sometimes audiences need to hear news they don’t want to hear, but if the news media refuses to cover it, then we’ve lost just a little bit more of our freedom because we know less. Up until about the mid-1960s radio and TV news was considered a public service and public service time counted for a great deal when stations applied for license renewal. Deregulation of broadcasting has changed all of that and when the media moguls discovered that you could make money on news, everything changed. Before news became a profit center, the media reported on stories that had direct effects on our lives. They reported in depth on congressional tax bills, on city council meetings and on corruption in government and in business. Handouts like news releases were pretty much ignored and never were used verbatim. Reporters had beats and dug into issues to find the real news. Today’s newsrooms are much different. Speeches, emails and tweets and other items from the social media are taken seriously with little investigation into motivation. Newsrooms are flooded with electronic news tips. Reporters rarely if ever find an issue and are allowed to dig until they come up with something. They are assigned issues to cover and often given the angle in the assignment. That’s not the journalism I learned. The PBS Newshour is even more critical. On their April 26th broadcast this year, they made this observation. The internet has options, real news does exist, but finding it is difficult because of those who claim to be the defenders of truth but aren’t. Some call themselves Investigative journalists and what they present does appear to be just that. The end result, though, puts the lie to their efforts because rather than investigate they advocate. They make claims without evidence, editorialize and call it fact and never allow a spokesperson from the other side to speak. Here’s how to tell the difference. Investigative journalism will always give those they are investigating an opportunity to defend themselves and will make every attempt to get to the bottom of a story regardless of where the investigation leads them. Advocates report one side of a story and usually make light of opposing views if they mention them at all. The internet is rife with these phonies on both sides of the political aisle. Advocates are nothing more than shills for a cause. Unless they clearly identify themselves as one-sided, their brand of journalism is phony and unacceptable. While we can complain about the media and its corporate structure and the short unimportant stories, much of it is our fault. News consumers keep confirming that what they are getting is exactly what they want, and what they are getting is expertly packaged news and information and even entertainment that supports the agenda of the media owners. They will cause you to think you know the truth and to vote the way they want and all the while they are manipulating you in a manner that will cause you to defend what they are doing even if doing so causes harm to your life and your future. If you are really concerned and if you are really smart you’ll find other sources for your news. The truth is out there, the challenge is in finding it. The internet has much to offer, you just have to be sure that what you are hearing and seeing is fact and not fiction. The state of the media today places more pressure on the average American to ferret out the truth by other means and thank God there are other means. The sad truth is that nothing will change until Citizens United is overturned and the likelihood of that happening is extremely unlikely because the people who have to vote to overturn it are the very people who benefit from it. How sad. Posted in The News Media.Tagged broadcast, circulation, deregulation, Diversity, Edward R. Murrow., internet, media, ownership, print, profitability, ratings, regulation, social media.